Make one of our two beautiful vacation homes base camp for your Colorado Rocky Mountain experience. Spectacular mountain and river valley views, world class skiing, hiking, fishing, natural hot springs and much more make Acorn Lodging in Colorado an awe-inspiring vacation destination. Pagosa Springs offers some of the best fishing in the world, right near our vacation rentals in the San Juan River and also in the many nearby lakes and streams. Visit Best Fishing in Pagosa for more information. Enjoy spectacular and stunning scenery in every season. Visit the railroad'sspecial events pages for everything from Polar Express trips to Pumpkin and Fall Foliage excursions. Acorn Lodging Guests enjoy 10% off train ride tickets. A must do activity when visiting our area! We are some of the closest rental cabins (only 20 minutes or so) to this Fabulous Ski area that boasts the "most snow in Colorado." We have to say they have the best "champagne" powder we have ever skied or boarded! And unlike Vail, Steamboat or Aspen, their prices are very reasonable. They usually open around mid-November but check back often as sometimes they open on Halloween! Great prices, gorgeous trails, awesome ATV's! This is a must do when visiting Pagosa Springs in the fall, spring or summer. (PS Not available in the winter months). A short side trip will enable you to explore the cliff dwellings of the Anasazi. A site of international attraction, the culture represented at reflects more than 700 years of history. From approximately A.D. 600 through A.D. 1300, a community lived and flourished throughout the area, eventually building elaborate stone villages in the sheltered alcoves of the canyon walls. Call (970) 529-4465 for visiting information. Terraced to overlook the San Juan River, The Springs offers numerous hot pools to choose from. Temperatures ranging from 83 to 114 degrees F. (27-46 C.) ensure you will find the right comfort level. Four pools are designated as Adults Only, but The Springs also offers a large family-friendly swimming pool and 14 soaking pools and an outdoor movie theatre open to all ages. Swim attire is mandatory in all resort pools. Open until very late at night! We are located just off Highway 160, also known as "The Million Dollar Highway." Take a drive on one of Colorado's most scenic byways. Read this Road Trippers article for more information! The nearby Pagosa Springs Golf Club boasts a 27-Hole Championship Course. Pagosa Outside offers beginner and intermediate trips out of Pagosa on the San Juan River (May and June). Visit their web site for more information on guided trips, rentals and more. 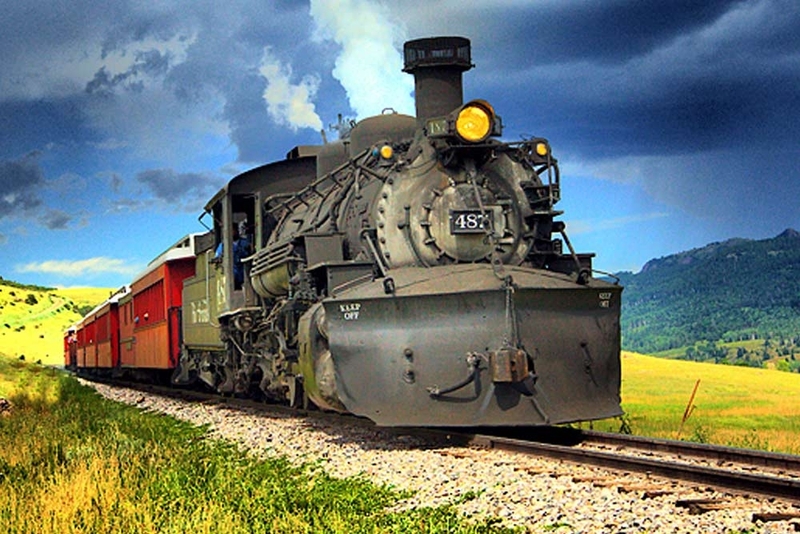 Climb aboard the National Historic Landmark for a 64-mile day trip you’ll never forget. 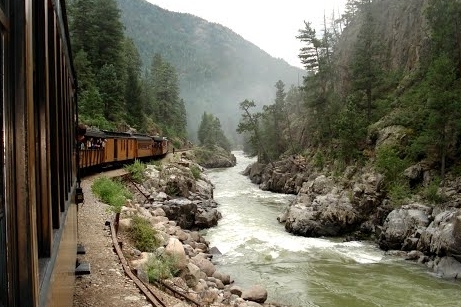 Their coal-fired steam engine carries you through steep mountain canyons, high desert, and lush meadows as you zig zag between the Colorado and New Mexico border. Open your eyes to spectacular and rare Western scenery which can only be viewed from our train’s unique route. Ride in the Victorian elegance of a deluxe parlor car or choose the budget-friendly coach car. Either way, a delicious buffet lunch is included.